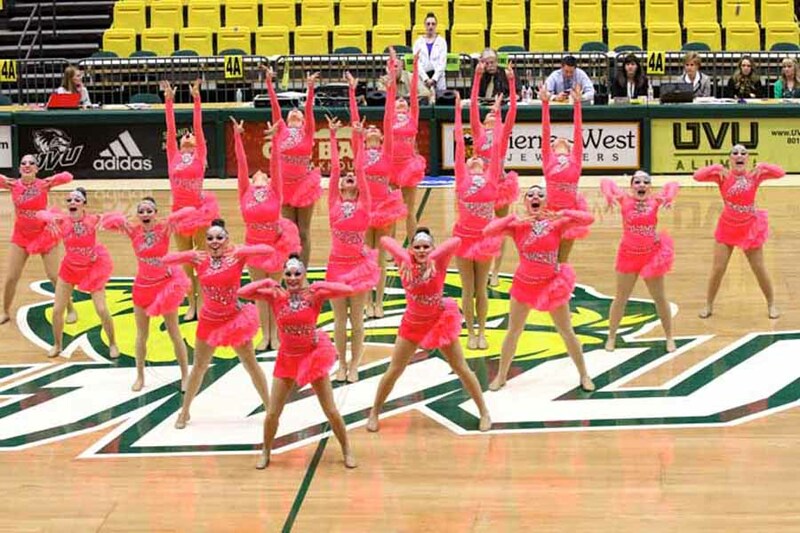 With the coordinated perfection that is required of elite drill teams to win in competition, anything that might cause a participant to perform at less than 100 percent seems like it would be a disqualifier. 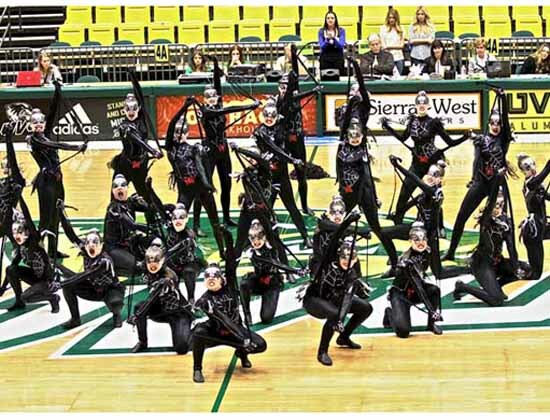 Yet, with team expectations that always put them in contention for the 5A state title, the 2014-2015 Bingham Minerettes feature two young ladies with physical conditions that would sideline most of us. Through an amazing dedication and a strong support system from the teammates, senior Kassie Andus and Lexi Mirelles are not just surviving, but thriving, despite the obstacles in their paths. The team’s coach, Jamyn Miller, is amazed at what both young ladies are accomplishing and she considers their participation on the team to be nothing short of miraculous. During the squad’s tryouts in March, Andus took a fall and injured her foot. It was the kind of break that was difficult to diagnose, a Lisfranc fracture. While she waited for the correct diagnosis, Andus took a month off and then returned to training, but the pain was ongoing. All signs pointed to a senior year without drill for Andus, as doctors told her that 50 percent of people with this injury never return to dance, and certainly not in just a few months. Her final high school competition season was just around the corner. After treatment, the senior was committed to being part of the Minerettes during that final season and she set out on a course to make that happen. There is still a lot of pain for Andus, but not enough to get her off the floor. She has been dancing since seventh grade, and she did not want to see it end with an injury. Minerette team captain Sidney Ford understands her teammate’s desire to fight through. As much as she understands Andus’ desire to compete and be part of the team, Ford is impressed with the way her friend has pulled it off. “We watched her recover and she worked so hard,” Ford said. “She wasn’t someone who said ‘I’m hurt so I’m going to sit on the side. There’s nothing I can do.’ She was up and trying. Whether it was standing over there and hardly moving, like going through arms…She worked so hard to be back where she is right now. It was really cool. 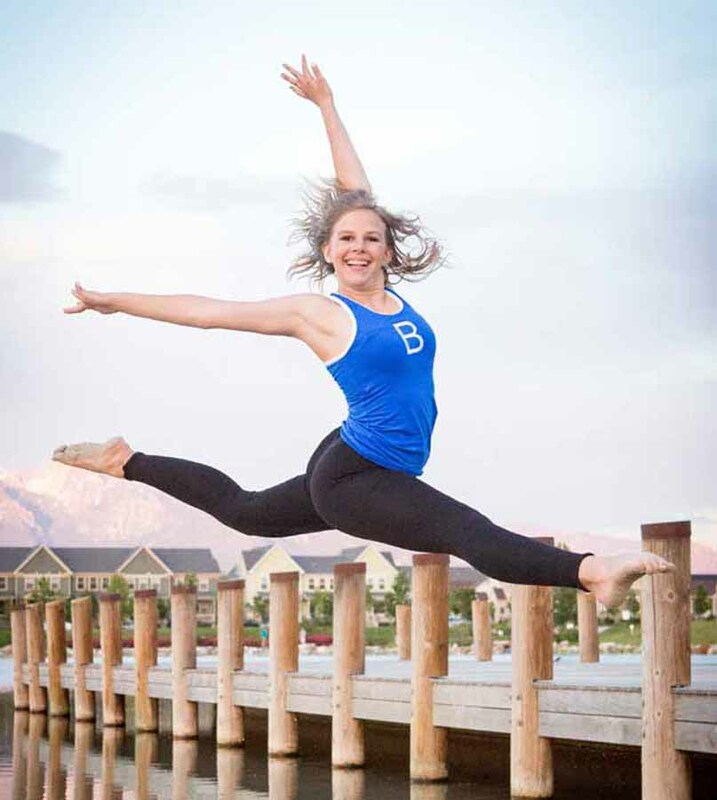 Bingham senior Kassie Andus keeps competing through a painful foot injury. Miller has so much confidence in Andus that she continues to ask a lot of the senior. Andus sits out the kick routine because of the impact on her foot, but if anything, her coach has put her in position to perform some of the most difficult maneuvers in the team’s dance routine. “Our dance routine is a very technical routine and you have to be at an elite level to do it,” Miller said. “The fact that we knew she could do it – the turns, the leaps, the aerial. She’s in the long-turn section of this routine, and that says a lot about her, to be able to work to get that mastered. A lot of credit goes to the medical professionals working with Andus. “One thing she was really smart about was, in her physical therapy, she showed him some of the dance moves in the routine that she knew she couldn’t do with her foot and they gave her exercises so she could do those and prepare her to be in the routine,” Miller said. While Andus deals with the pain that comes with fighting through injury, Mirelles is another story entirely. 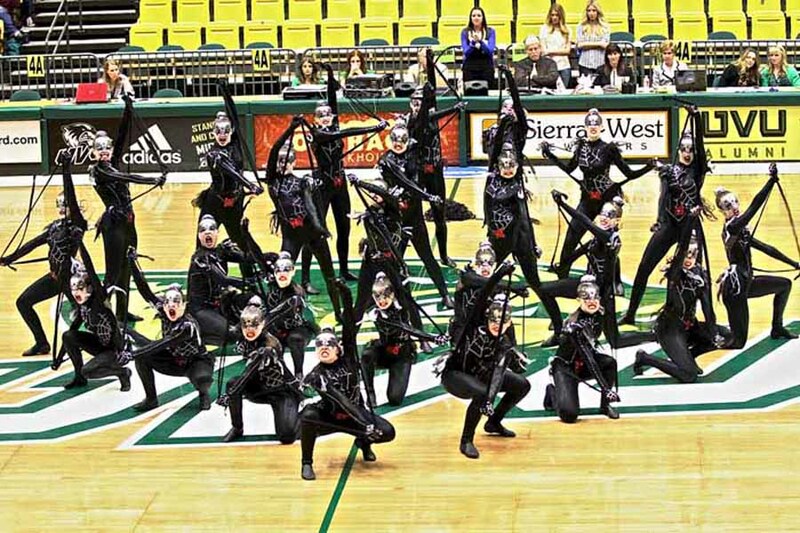 The perfection in staying in sync with your team that is required in dance and drill is hard enough when you can hear and follow the music. Without that, it seems to be impossible. At that same March tryout, another amazing story began to unfold for the Minerettes, with the arrival to the team of Mirelles. Lexi Mirelles competes at the highest levels of dance despite being deaf. Mirelles has been deaf pretty much her entire life as they confirmed the depth of her hearing problems when she was five years old, about the same time she started dancing, beginning with hip-hop. The hearing aids help some, but even with them, Mirelles has to use every trick she can muster to help her compete at a high level in the sport she loves. She picks up some of the music better than other parts. The conditions under which the team competes can also have an adverse effect on Mirelles. Crowd noise, for example, impacts her much differently than it does other people. “The girls are so in sync and every little thing has to be right, and sometimes the music gets weird and if it’s too loud or too quiet, that’s the hardest part, trying to stay in sync,” Mirelles said. “You have to be tight, but if I can’t hear the music, you don’t know how tight you are because I can’t really hear the music. I just mostly watch people. Teammate and close friend Savannah Morris has been dancing with Mirelles since the two were in the seventh grade. Morris can’t remember a time when her friend has not been “on” with her dancing. Andus is also impressed with the way Mirelles is able to “hear” the music and stay in sync with the rest of the team. Ford has been watching her new teammate for quite a while, and she is also a fan of the work ethic that makes Mirelles successful. “I’ve known Lexi for a long time,” Ford said. “I can’t even explain it. I’m listening to it to get every count from the music. I don’t understand how she does it. She’ll wear hearing aids, but if one falls out, she’s not trying to put it back in while she’s dancing, she just keeps on dancing. Miller does what she can to make things easier for Mirelles, but she does have to rely on others to assist with that, particularly when it comes to competition. Even with that as a concern, her teammates have the highest level of confidence in Mirelles. Mirelles has always believed dancing was for her and she has never allowed being deaf to deter her. “When I was little, I always thought girls should be dancers,” Mirelles said. “I did hip-hop because I thought hip-hop was cool. I’m not real good at sports, so I thought dance was more my thing. I’ve always done it and I didn’t ever think of anything else. The presence of both Mirelles and Andus on the Minerette squad has probably done more for everyone else than it has even for them.